Adventures in the Endless Pursuit of Entertainment: "Has art ever been more relevant?" "Has art ever been more relevant?" Last weekend, I attended a concert in San Francisco that will no doubt stay with me for many years to come, for many special reasons. 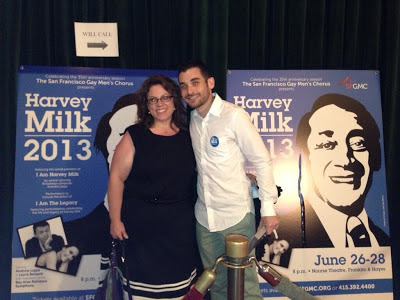 As soon as I heard from my dear friend Noah Himmelstein that he would be stage directing the world premier of I AM HARVEY MILK, by Andrew Lippa, I knew I wanted to be there. I decided to make it a great long weekend in San Francisco and arranged for my sister Mary to come along with me. I AM HARVEY MILK ("IAHM") was commissioned by the San Francisco Gay Men's Chorus ("SFGMC"), along with other gay men's choruses around the country. The commission was to celebrate the 35th anniversary of the choir, which was born on the night of Harvey Milk's assassination as people gathered in a candlelight vigil over his shocking death. The premier was planned much in advance to take place the last weekend of June 2013, coinciding with Pride Weekend. Who would have predicted that the United States Supreme Court would hand down its opinions on Defense of Marriage Act ("DOMA") and California's Prop 8 the very week of the performances? What serendipity! From San Francisco where he was preparing for Opening Night, Noah texted me, "Has art ever been more relevant?" The oratorio is for the men's choir, and in the case of the SFGMC, approximately 300 voices. The piece has three soloists, a soprano, a young male and a tenor. The soprano is a generic female role - once appearing as an operatic soprano, a teacher and as mother although the characters are presented literally. The young male and the tenor are the boy Harvey and grown Harvey respectively. Laura Benanti sang the role of the soprano, Noah Marlowe sang young Harvey and Andrew Lippa himself sang grown Harvey. The piece is more or less a song cycle based on biography of Harvey Milk, the first openly gay elected official. Harvey, along with the mayor, was assassinated in 1978 by a fellow San Francisco city supervisor. The piece also is based on generally the struggle against oppression of gay and lesbians. It weaves Harvey's message of coming out and standing up and fighting for your belief and your life. It's roughly an hour long. The music ranges from heartbreaking to frivolous to joyous. The opening piece includes a haunting melody that appears again and again throughout the work and centers around Harvey's love of opera - loosely, I want my life to be an operatic aria (I don't have my playbill in front of me as I write this). It's gorgeous. One piece, a variation on the saying, "Sticks and Stones will break my bones," is absolutely heart-wrenching. There is a pause in the drama with sort of a disco song that made me want to dance right of of my seat, "Friday Night in the Castro." It's such a celebration of the culture and the period, but it's timeless. The soprano's two most memorable songs were "Was I Wrong" and "Leap." They are completely opposite stylistically and emotionally. Was I Wrong conveys a mother's pain and Leap celebrates mother's encouragement. Leap is a real anthem and really had the entire audience going. The concert, 3 nights only, was at the Nourse Auditorium, which is a couple of blocks from the San Francisco opera house, on Hays Street. I think it was approximately 2000 seats. The entire night was an emotional and audible feast for the senses. It was thrilling to be there and hear and witness this auspicious piece of art, all the while knowing that the implications were so much more than just a night of entertainment. My heart swells with the realization that my Noah was a part of this piece - his attention to the smallest detail in the visual presentation took it beyond any expectations of attending a choir concert. The lighting was spectacular and even the smallest movements from the choir and the soloists brought words and music to soaring heights. I've known for 9 years now that Noah had a special talent but witnessing his involvement and leadership with this piece was beyond anything I had dreamed. It feels and unarguably is artistically and socially important. Even with the DOMA ruled unconstitutional and the appeal of Prop 8 dismissed and marriage being an equal right for all humans in the United States under federal law, I know there is much more to learn from Harvey Milk's life and what he worked for - further production of this piece will undoubtedly lend to the further opening of hearts and minds and will certainly inspire people of all backgrounds to continue to work for acceptance and equality.